From the Canyon Edge: Gazzang Bang! With my friends and former colleagues sprinting in Budapest at Ubuntu's Distro Rally, I already miss our nightly Ubuntu All-Stars jam sessions :-( It was always such a great outlet for creativity and right-brain activity, after long days devoted to left-brain engineering work. I think some of my best memories over the last four years are jamming with Tony, Pete, Amber, Jorge, Matt, Hugh, Luke, Jono, Barry, and countless others! 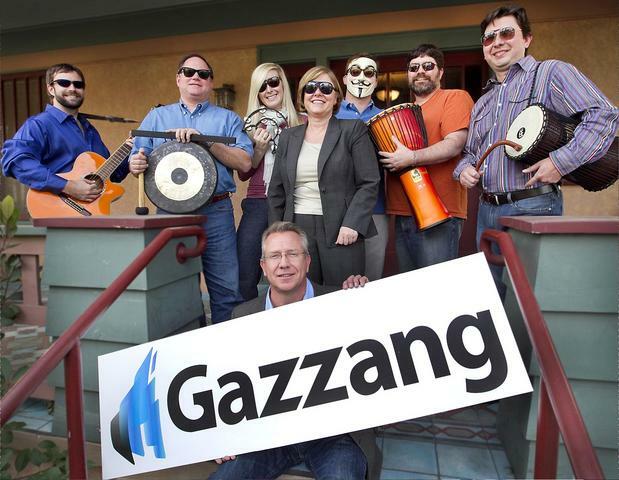 Searching for some of the same camaraderie and revelry, we at Gazzang have formed our own band -- Gazzang Bang! And remarkably, we actually got a byline of press coverage and a band portrait in our local Austin American Statesman newspaper this weekend! The article was actually about the background of some of the funny/silly/unusual names of current Austin tech start-ups, of which Gazzang was one (along with Infochimps, Springbox, and UShip).